What is Waterfall model ? It was the first model of tests, is simple to understand and linear-sequential. 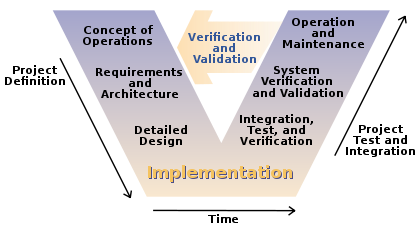 You can use the waterfall model when the requirements are very well known, clear and fixed; Product definition is stable; No changes in the scope; You understood the technology; There are no ambiguous requirements; Resources with required expertise are available freely; Project is short. One of the differences between agile and waterfall is that testing of the software is conducted at different stages during the software development life-cycle. In the Waterfall model, there is always a separate testing phase near the completion of an implementation phase. However, in agile development and especially extreme programming, testing is usually done concurrently with coding, or at least, testing jobs start in the early days of iteration. – This model is simple and easy to understand and use. – It is easy to manage due to the rigidity of the model – each phase has specific deliverables and a review process. – In this model phases are processed and completed one at a time. Phases do not overlap. – Waterfall model works well for smaller projects where requirements are very well understood. – Once an application is in the testing stage, it is very difficult to go back and change something that was not well-thought out in the concept stage. – No working software is produced until late during the life cycle. – High amounts of risk and uncertainty. – Not a good model for complex and object-oriented projects. – Poor model for long and ongoing projects. – Not suitable for the projects where requirements are at a moderate to high risk of changing. Today I will post a shell script that I am using to test a webservice. If you need a xml to test the performance of the server/webservice with Jmeter or if you just need generate a lot of xmls to make any type of test, this example can be useful. echo "What do you want generate ?" echo "How many files ?" It is helping me a lot lately , I do not need spend a lot of time doing some complex code or generate these files manually. I hope this helps you too . Java reflection it is useful to instantiate new objects, invoke methods and get/set field values without knowing the names of the classes/methods… and when you want to inspect classes, interfaces, fields and methods at runtime. It is used to examine and modify the structure and code in the same system at runtime. For example, say you have an object of an unknown type in Java, and you would like to call a ‘doSomething’ method on it if one exists. Java’s static typing system isn’t really designed to support this unless the object conforms to a known interface, but using reflection, your code can look at the object and find out if it has a method called ‘doSomething’ and then call it if you want to. What is happening here? It is obtaining the Class object from the class called MyObject, it is using the class object to get a list of methods in this class and print out their names. For a full list you should consult the JavaDoc for java.lang.Class. With the package you can have a look in the Manifest of the JAR and others. If you need the complete list of interfaces, you will need to consult both class and superclasses recursively. You can find more details about the reflection in each constructor, annotations. fields in this tutorial. This was only a brief post to get start to use.